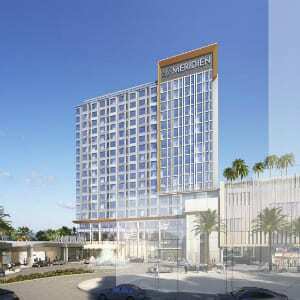 Following a signing ceremony, Interstate Hotels & Resorts has announced its executed management agreement with New York City-based SCG America (SCGA) – the company leading the development of a new Le Méridien hotel in Orange County, California. Construction is anticipated to commence Q3 of 2019 with the hotel slated to open in 2021. This latest management contract is part of the company’s strategy to grow its high-end hotel portfolio and follows news of Interstate’s two Westin hotel additions (Alexandria and Portland, Maine) and the historic Hill Top House Hotel luxury destination retreat project in Harpers Ferry, West Virginia. Inspired by the brand’s French heritage – born in 1960s Paris during an era of glamorous travel, the new Le Méridien hotel will feature approximately 400 mid-century modern designed guestrooms and suites as well as the brand’s innovative signature lobby concept that transforms the traditional lobby into a communal coffee house atmosphere by day and sophisticated cocktail lounge by night. Echoing the brand’s distinctly European spirit of savouring the good life, the hotel also features a signature restaurant and rooftop bar, well-equipped fitness centre, swimming pool, on-site spa, and 39,000 sq. ft. of meeting and event space ideal for convention business, leisure and group travel. In addition to Le Méridien, Interstate Hotels & Resorts is accelerating with a global outlook and a robust mix of projects in the pipeline. Interstate’s depth of experience across all lodging segments and asset classes drives results in each of its managed hotels worldwide.